The FourPress Bandaging System is used to effectively manage venous leg ulcers and related conditions. Composed of four bandages that work together, the FourPress Bandaging System provides effective sustained compression for up to seven days when applied as directed. FourPress also features Coban™ LF, a latex-free cohesive bandage from 3M that's easy to unroll and apply. Layer One: Padding Bandage- a blend of synthetic materials that absorbs wound exudate. This comfortable non-woven layer primarily provides protection to bony prominences. Layer Two: Crepe bandage - anchors and smooths the padding layer while absorbing exudate. Layer Three: Compression bandage - conforms to any contour while providing about one-half the compression of the system. Layer Four: Cohesive bandage – latex-free bandage that adheres to itself and secures the bandage system without tape for week-long compression. 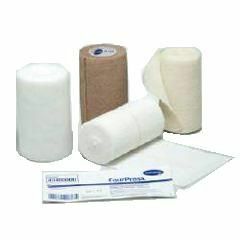 FourPress Latex-Free Compression Bandaging System Kit contains 4 bandages and 3 tape strips. Padding Bandage - 4" x 3.8 yds. Crepe Bandage - 4" x 4.9 yds. Compression Bandage - 4" x 9.5 yds. Cohesive Bandage - 4" x 6.5 yds.